NE Remembrance Day 2019 | Oshwal Association of the U.K.
On Sunday 13th January 2019, the North East Area Cultural and Heritage Committee organised their 5th Remembrance Day, which saw the largest gathering to date, honouring the lives of our loved ones, who have sadly departed this world. 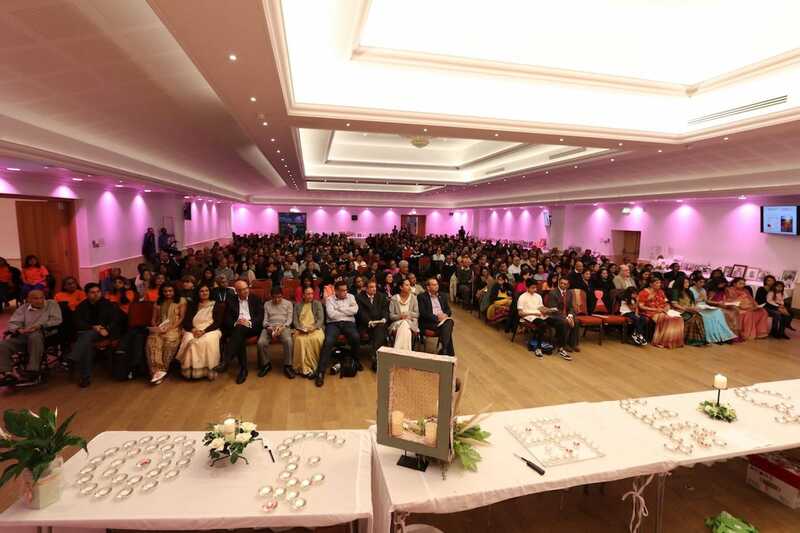 We were greatly encouraged to see almost 500 members from our community, both young and old, gathered at Oshwal Centre to celebrate the lives of their loved ones. This event brought together family members and colleagues in remembering the lives and memories of parents, brothers, sisters, sons, daughters and friends. It was an opportunity to look back at their lives, to celebrate the tremendous contributions and sacrifices that they made in making everyone’s lives better. It was also a time to reflect on the lasting memories both good and bad, we shared with them, how these bonds have influenced us, made us stronger, bringing us closer together and prepared us for the future. The afternoon was opened by Harshi Nishad Gudhka reciting the Stavan Om Mangalam. Stavans, prayers, poems in English & Gujarati were recited, Jayeshbhai gave a short lecture on Samadhi Bhavna, there was even a 10-minute meditation session written and guided by Aayushi Nishad Gudhka, where there was pin drop silence throughout. Young Veer Minesh Shah sang Charno Me Tere Rahakar Bhagwan, and finally, Aanya and Aashna Kishor Pankhania sang Anand Data. This was followed by the names of all 143 loved ones called and their families invited to light a candle in their name. The mood and atmosphere were just perfect, the children and all of the speakers captured the essence of why we were present at the event. It was so wonderful to watch the young children standing up on stage with such confidence and grace. That was truly inspiring and shows that the future is bright for the Oshwal Community as a whole, and especially, North East Area, when we have such talented children in our community. The programme finished with delicious refreshments, kindly donated by our donors. The North East Area Culture and Heritage committee would like to thank the many volunteers who support us and work behind the scenes, to ensure everything runs so smoothly and all of the friends and families that came to remember the memories and lives of those who are no longer with us, to create a community atmosphere. It was very well organised. Children who took part deserve enormous praise. Special thanks to Aayushi. She was an inspirational girl and touched many people’s hearts. The food was delicious and plenty of it too. Thank you to all the organisers and the volunteers for another successful “Remembrance Day”. Excellent programme. Very well organised and found the meditation amazing. Especially by such a young girl. Many congrats to her. Really good at timing and felt well to sing in groups.